Eisenheim: Are you completely corrupt? Uhl: No, no, not completely. No. It's always been tough to make a convincing movie about a magician�we know on some level that the camera can be the greatest trickster of them all, and especially in our time of CGI, we've become inured to seeing fantastic, impossible images as a matter of course. What would induce gasps in other times provokes only yawns in ours; add to this the challenge of filming some of the fiction by Steven Millhauser, a terrific writer but whose seductive and sinuous exercises in points of view and unreliable narrators seem to defy being put successfully onto the screen, and you get a sense of the challenge that lay before the filmmakers here. (The movie is based on a Millhauser short story.) 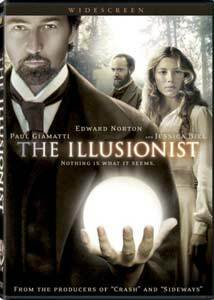 A tip of the homburg, then, to Neil Burger, who adapted the story for the screen and directed The Illusionist, an artfully spun tale that's both intriguing and enchanting. The setup has the feel of a fairy tale�it's even set in the Vienna woods of the nineteenth century. Eduard, a working-class adolescent, despite his good nature, is quickly branded as the boy from the wrong side of the tracks�the fetching young Sophie is the Duchess van Taschen, and a romance with a peasant boy is absolutely out of the question. Eduard is forced to disappear, and we quickly vault ahead some fifteen years, the young man returning as Eisenheim the Illusionist, who practices the dark arts. His magic show has made him the toast of Vienna, and attracted the attention of the crown prince; he comes to Eisenheim's show with his intended, who of course is our Sophie, now all grown up and still holding a place in her heart for her first love. Edward Norton plays Eisenheim, and he combines an earnestness with something more sinister�we know the fellow always has another ace up his sleeve, but there's no denying his charm, especially if you're the Duchess, played by Jessica Biel. The prince's bagman becomes Eisenheim's Javert, and as Chief Inspector Walter Uhl, Paul Giamatti seriously gets his James Mason on�he may have the most expressive face of any actor working in movies today, and his arched eyebrows and sidelong glances give dimensionality to a character that might have been little more than political ambition in a policeman's uniform. Everyone in the cast uses a vaguely Austrian accent�the dialect coach might have rode herd a little more tightly, as the diction meanders now and again, but it transports us to the period convincingly enough. Burger is wonderful at suggesting that Eisenheim may in fact be messing with the primal forces of nature, and the notes of magic realism are struck delicately enough that they never seem preposterous. The filmmaking style is deliberately old-fashioned as well, with irises in and out as the favored method of transition, and a decidedly Old World sepia tone to the print. To discuss the plot any more extensively would rob you of the pleasures of watching it unfold; and the movie has an absolute kicker of an ending. The whole undertaking likely will strike some as too cerebral or mechanical�if you were the little kid who watched the magic show and shouted out how you thought the tricks were done rather than giving yourself over to them, you may sneer at The Illusionist. But if you do, it's your loss; let yourself go and pay no attention to the man behind the curtain. Image Transfer Review: Occasional scratches on the print are the only thing that mar the transfer; I should note that dOc was sent a screener disc for purposes of review, so with the final product, your mileage may vary. Audio Transfer Review: Philip Glass' score may be interesting on its own merits, but on some level it seems like the one aspect of the filmmaking that's egregiously out of tone with the rest of the piece. (It's the same problem we saw with his score for The Hours.) Otherwise, the audio transfer is clean enough, with some rumblings on the low end of the scale. Extras Review: Burger's commentary track connects the usual dots�he describes the origins of the project (with a nod to David Blaine), discusses the location shoot in the Czech Republic, and talks us through a lot of what's sleight of hand, and what's computer enhanced. But about halfway home he seems to run out of material, and is reduced to simply narrating the story back at us. He comes across as a very bright and talented guy, but you sort of wish he had brought in some of the other filmmakers to fill out the track. Aside from some trailers, the only other extras are a pair of pedestrian making-of pieces, one focusing on the film's leading lady (Jessica Biel on The Illusionist), which runs barely 90 seconds, and The Making of The Illusionist, clips padded out with junket interview footage from Biel, Norton, Giamatti, and Rufus Sewell, who really is rather smashing as Crown Prince Leopold. A devilish, stylish entertainment, one that can cast its spell over even the most cynical among us, and that features Giamatti and Norton having a ripping good time.